This guide for patients is provided by the Agency for Healthcare Research and Quality of the US Department of Health and Human Services. It appears to be a useful guide with generally good information. However, in one section of the guide, warfarin (brand name Coumadin) is described as a "blood thinner." Although many healthcare professions refer to warfarin as a blood thinner for simplicity, it should be noted that warfarin does not actually make blood thinner. Rather, warfarin prevents blood clots by interfering with your body's ability to make certain proteins needed for clots to form. 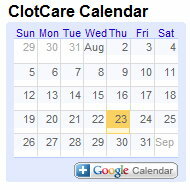 See ClotCare's warfarin FAQs for more information on how warfarin works. Printed copies can be ordered by calling 1-800-358-9295 or sending an e-mail to ahrqpubs@ahrq.gov.